I use cloth diapers because they are good for the environment. I want to limit the amount of waste that I send to landfills and incinerators and I want to limit the amount of natural resources that are consumed for products that I just throw away. Some people use cloth diapers because of the health benefits of them. There is a huge debate about the chemicals that go into making diapers, particularly the leading brands of Pampers and Huggies. Diapers like Pampers and Huggies absorb well – because they have chemicals in the diapers that have chemical reactions with the urine to turn it into a gel-like substance and hold it there next to your baby until you change the diaper. Have you ever had a Pampers explode all the gel out while still on your child? I’ve had it happen during a car trip and I found a gel-like mess all over the carseat in addition to a wet, miserable baby. Our son loves his cloth diapers! 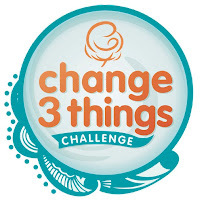 Today’s post was inspired by a new campaign to raise awareness about the environmental and ECONOMICAL benefits of cloth diapers: Change 3 Things: 3 cloth diapers. One planet. Big impact. One thing I don’t talk about much is the economical benefits of cloth diapers. It’s hard to look at $15-$25 price tags for a single diaper and think about economical benefits, but when you do calculations, it adds up. Have you thought about how much your diapers cost? When I buy disposables (and I do sometimes) I try not to think about it. This campaign is estimating about $0.25 per diaper, which is about what we have found buying in big boxes. Every cloth diaper change saves about $0.25 (depending on what brand of disposables you buy). If you save $0.75 a day, it may not seem like much, but those three diapers can save you approximately $260 over the upcoming year times 2-3 years before potty training is complet. In addition to the savings per diaper, you can save yourself time, money and gas for those emergency trips to the store when you run out of diapers. Of course, the real savings come in if you are using predominantly cloth diapers, I wash my diapers once every 2-3 days because a full load feels more efficient (and it is). Jennifer Labit, the founder of Cotton Babies designed several of the leading brands of cloth diapers, including one I use every day: BumGenius. She is always asked by news outlets and reporters “how many people use cloth diapers?” Unfortunately, there’s no good way to know. One of her goals with this campaign is for people who use cloth to stand up and be counted. There have been many strides recently to have the mainstream media realize that cloth diapering is not a niche activity by the rapid environmentalists, but something that every day people are doing every day. This is one more step in that direction. For this reason, I urge you to “like” the Facebook page for this campaign so you can be counted too. Let me leave you with this parting thought: It can take up to 500 years for one disposable diaper to decompose, and even if it is a “compostable” diaper, it has to be disposed of under the proper conditions for it to decompose. In a standard landfill, not even a piece of fruit will decompose. Happy Greening and join us in changing some cloth diapers! I wrote a comment a few days ago, but i think I closed the page before I finished it. 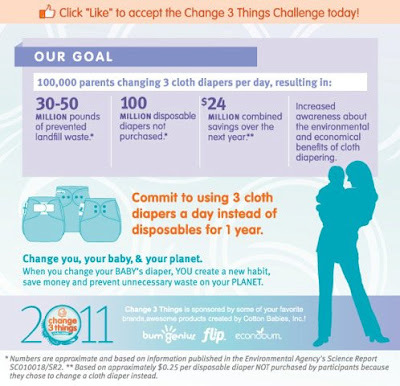 I have been cloth diapering my 3 babies since my oldest was 1 1/2 and my twins were about 6 or 7 months old. I very rarely use disposables unless we have a huge rash issue or a washing machine issue like we do now. We just got another washer and I can’t wait to go back to cloth. My older son is now 3 and will be going to pre-scchool on Mon. I acutally advocated for them to let me use cloth diapers while he’s at school, because at first I thought we were going to have to use disposables.I’ve been cloth diapering 3 kids for at least 1 1/2 years and the only thing I would change is I would have started sooner. I love Diaper Lab! I was raised with cloth diapers, and I don’t see why we shouldn’t revive this idea. It’s a big money saver, as practical as getting wholesale clothes instead of designer ones.